Chloe Sowry drives in a run with one of her three hits to go 3-3 on the day with 2-RBIs for the Lady Wave in a run rule win over Vandalia-Butler. 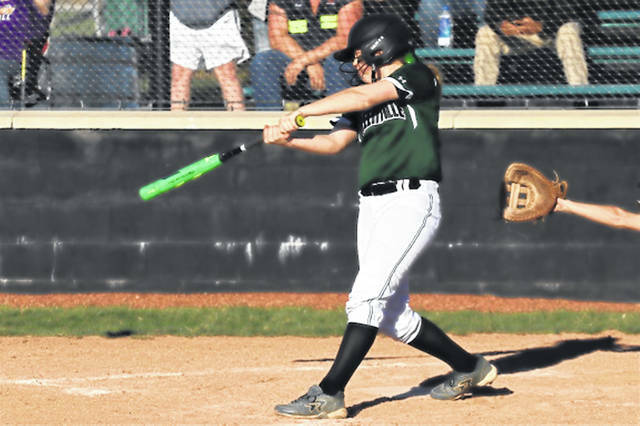 GREENVILLE – The young Lady Wave softball team earned another run rule win of the season downing the visiting Vandalia-Butler Lady Aviators 14-4 Tuesday night at Stebbins Field following a 11-3 Monday night road win over the Lady Aviators. The visitors used a game opening Morgan Wright home run to lead 1-0 with the Lady Wave coming to the plate for their first at-bat of the night. Morgan Gilbert got Greenville rolling with an single to open play in the Lady Wave’s half of the first followed by a Lani Shilt walk. Kennedy Fashner drove a RBI single to right scoring Gilbert and moving Shilt to third to knot the score at 1-1. The Lady Wave used a hit batsman to put Susi Blocher on first and load the bases for N Davidson to knock a 2-run single and give GHS a 3-1 advantage. Nyesha Wright legged out an infield RBI single scoring Blocher making it a 4-1 game followed by a RBI single off the bat of Chloe Sowry bringing a Butler pitching change with Greenville up 5-1. Courtney Bryson greeted the Lady Aviators new pitcher with a single loading the bases and setting up a RBI walk from the Lady Wave’s lone senior, Lani Shilt to give Greenville a commanding 6-1 lead after one inning of play. Butler added a run in the top of the second while the Lady Wave was getting an RBI each from Blocker and Sowry plating two runs in the bottom of the inning to make it an 8-2 game heading to the third. Neither team would dent the plate in the third but the Lady Wave made it a 12-2 game in the bottom of the fourth getting with RBIs from Gilbert and Shilt and an Aviators wild pitch allowing a run. Wright crushed her second home run of the night for Butler, a 2-run homer to postpone a Lady Wave run rule win for an inning. Greenville earned the win in the bottom of the sixth by way of a Shilt leadoff double, a Mayo-Behnken RBI single and walk-off Nyesha Wright RBI single to center for the run rule win. From her shortstop position, Morgan Gilbert had several spectacular infield plays for Greenville. The Lady Wave pounded out 16 hits on the day while playing error free ball. Butler collected seven hits and committed one error. Sowry paced GHS at the plate going 3-3 with a walk and 2-RBIs. Davidson went 1-2 with 3-RBIs and a run scored. Shilt and Gilbert both went 2-5 with a RBI and 2-runs. Bryson was 2-3 with a walk and a run scored. Wright went 2-4 with a walk, 2-RBIs and a run. Fashner was 2-4 with a RBI, Blocher 2-4 with 2-runs and Mayo-Behnken 1-4 with a walk, a RBI and a run. Sage Fellers scored 2-runs as a pinch runner for the Lady Wave. Fashner opened on the mound for the Lady Wave surrendering 2-runs on 3-hits while striking out two. Caitlin Christman tossed three innings giving up 2-runs on 4-hits, striking out three and walking one. Grace Shaffer pitched one inning of shutout ball while not allowing a hit, a walk and striking out one. With the win, the Lady Wave improve to 9-1on the season and 6-0 in conference play. https://www.dailyadvocate.com/wp-content/uploads/sites/34/2019/04/web1_8-inch-Chloe-Sowry.jpgChloe Sowry drives in a run with one of her three hits to go 3-3 on the day with 2-RBIs for the Lady Wave in a run rule win over Vandalia-Butler.